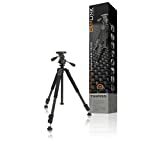 This tripod with 3 stage high low locking positions has multi angle low level capabilities to adequalty stabilise your camera for when you want to take photographs close to the ground. 3 section channel legs 28 mm with quick locks. 3-way friction pan & tilt head. Quick release plate. This entry was posted in Discount Photography and tagged Black, Camlink, Carbon, Fibre, Professional, Quality, Tripod by Ball Photo. Bookmark the permalink.